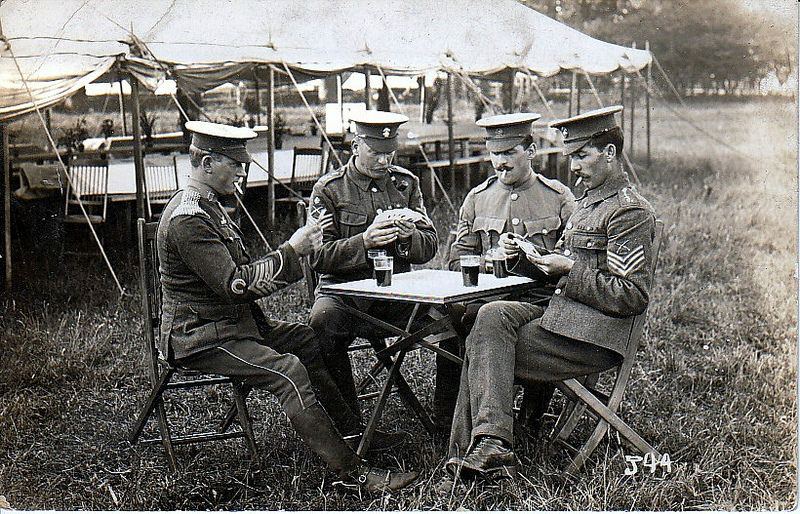 The 4th Bn settled into the typical routine of life on the Western Front. Taking its turn with the other Bns of the 50th Division in the trenches to the east of Armentieres. For information on 4th Bn burial and memorial sites for casualties sustained in this sector, select the link. The boat docked in Boulogne 1 at 9.40pm and the Bn 2 marched to St Martins Rest Camp 3. At 11am, after the Bn parade and usual inspection, the entire Northumbrian Divn marched four miles over very dusty roads to Pont de Briques, to await a train. The men were very cheerful, practising their French on everyone they passed. The train arrived after a short while and the Bn discovered that the transport and machine gun sections, under the command of Capt Webster, Lt Bell and Lt Good, were already aboard. They had sailed from Southampton to Le Havre a few days before. The officers boarded first class carriages while thirty men clambered into each of the covered cattle wagons coupled behind. The train departed at 2pm and steamed slowly toward the northeast with the wagon side doors left open, so the men were able to sit on the steps and enjoy the fresh air and pretty countryside. It was only a short distance but it was past 6pm when the Bn disembarked at Bavinchove 4. ‘D’ Coy were tasked with unloading the transport wagons, while the rest of the Bn marched to their billets for the night. With the unloading complete and the wagons harnessed, 'D’ Coy set off in the same direction, but it would seem that the billeting officer had not explained precisely where their billets were located. They had marched two miles before they were informed that they should be in a farmhouse close to the station they had just left. The billets were eventually located and by 9.20pm the entire Coy were crowded, but comfortably settled in one large shed. Normal protocol was adhered to, with all the Bn officers allocated rooms in the farmhouse while the NCOs and men bedded down on straw in the outbuildings and barns. The outbuildings allotted to ‘A’ Coy were not large enough to accommodate them all, so many had to bivouac outside. It was no hardship on this occasion, because it was a fine and warm night. However, those outside could not fail to notice the flashes of distant artillery fire and shell bursts in the sky to the east. After assembling outside the station at 10am, the Bn marched seven miles northwards, up the steep winding road to the hill top town of Cassel and on to Oudezeele, arriving at 3pm. On the outskirts of Oudezeele they past billets occupied by the York and Durham Bde and DLI Bde. Once again the Bn were billeted in farms, but many of them were quite small, so the Coys were split into platoons and allotted a farm each. Whilst the fusiliers were settling into their billets, twenty miles to the north-east the Germans were preparing to use their latest weapon for the first time. At 5pm, after an eleven hour delay due to a lack of wind, Chlorine gas was released from 6000 cylinders opposite front line trenches occupied by French colonial troops of the 45th (Algerian) Divn. The trenches were near Langemarck in the northern part of a bulge in the front line around the ancient Belgium town of Ypres, held jointly by the French and British army. This bulge, known as the Ypres Salient, covered a low lying farming area criss-crossed by drainage ditches. A light north-easterly wind blew the greenish yellow cloud of gas towards the Algerians and was accompanied by heavy and concentrated shelling of Ypres, nearby villages and the French forward trenches. The gas was heavier than air so it sank into all the trenches in its path, choking and asphyxiating the occupants. “Those who were not incapacitated by the gas fled in terror leaving a gap in the line of approximately four miles. Some elements of the French Divn on the right flank managed to hang on. The Canadians were also severely affected by the gas. A four-mile stretch of the front line was left wide open. The German infantry units equipped with respirators advanced behind the barrage fifteen minutes after the gas was released”. “...the German soldiers simply walked forward through the allied line, over the bodies of the dead, lying sprawled out, faces discoloured and contorted in grimaces of agony. Within an hour the Germans had advanced more than a mile and they had hardly needed to fire a shot” (MacDonald: p.195). However, the Germans failed to press home their advantage and the pause in the enemy's advance gave the British valuable time in which to push troops forward to fill dangerous gaps in the line. Nevertheless, the threat posed to Ypres and the channel ports beyond would determine the immediate future of the Northumbrian Divn. News of the German attack reached Maj. Gen. Sir W.F.L Lindsay (GOC Northumbrian Divn 5) at 10.40pm. Ten minutes later orders arrived instructing him to have six coys of the York and Durham Bde fully equipped and ready to move by motor bus. At 11.29pm a supplementary order was received stating that all units of the Northumberland Bde were to 'stand by' in billets, ready to turn out immediately, fully equipped. At 11.48pm the 10th and 16th Bns (1st Canadian Divn) counterattacked in an attempt to recapture Kitchener's Wood. The wood was of great tactical advantage to whoever controlled it, as it lay on a small ridge running north from the village of St Julien, protecting it from the northwest. The attack was partially successful in that the Germans were cleared from most of the wood and a new line was established on its southern edge. During the early hours of the morning a hastily assembled force of part battalions known as Geddes detachment advanced and succeeded in linking the Canadian position, south of Kitcheners Wood, with the Yser Canal. The French planned to counterattack over the ground lost the previous afternoon. At a meeting in Cassell 6 between the French General Foch and Sir John French, Sir John agreed to co-operate in the attempt. On returning to his HQ at Hazebrouck, Sir John decided to increase the strength of the 2nd Army (GOC - General Sir Horace Smith-Dorrien) by placing the three infantry Bdes of the Northumbrian Divn at its disposal. At 5.30am Northumbrian Divn HQ received orders from General HQ for two Infantry Bdes to be held in readiness to move. At 6.30am Northumberland Bde HQ received orders from Divn HQ, instructing them to concentrate the Bde around the town of Winnezeele. These orders were issued to the four Bns at 6.45am. The 4th Bn cleaned their billets before assembling at 7.30am, just outside the village on the road east to Winnezeele 7. They marched off under the impression that they were moving a little closer to the front line and to a fresh billeting area, but it was at 9.05am that the Northumbrian Divn was placed at the disposal of the 2nd Army (now under the command of Gen. Sir H. Plumer). At 10.20am the Bde was brought to a halt on the outskirts of Winnezeele, the officers assuming this was so that the colonel and interpreter could inspect and allocate billets to the Bn, but a rumour soon spread that there had been developments at the front, necessitating a change to the programme. In actual fact, all four infantry Bns had been halted alongside Bde HQs, where they were to spend an uncomfortable three hours exposed to a cold wind awaiting orders. Meanwhile, the York and Durham, and Durham Light Infantry Bdes had been attached to the 28th Divn and were moving towards the front line. Orders for the Northumberland Bde arrived at Divn HQ in Steenvoorde from HQ 2nd Army at 11.45am. 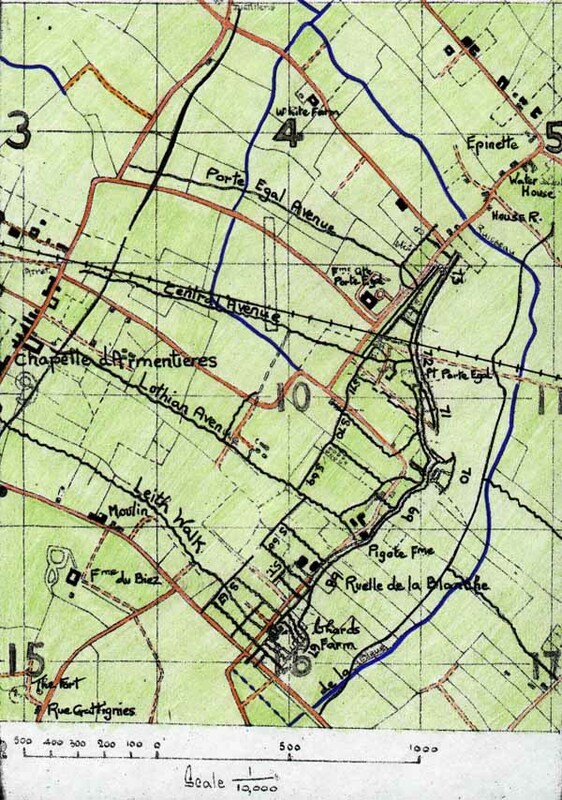 They stated that the Bde, accompanied by a RE Field Company and supply section train, were to march from Winnezeele via Doglandt, Watou 8 and Poperinghe 9 and occupy the third line defences astride the Poperinghe-Ypres road near the town of Brandhoek. Bns received these orders from Bde HQ at 12.30pm, at which time cases of maps were opened by the roadside and distributed among the officers and NCO’s. The Bde marched off shortly after 1pm, the 5th Bn leading the way, closely followed by the 6th, 7th and 4th Bns, 2nd Field Coy RE, 1st Northumberland Field Ambulance, No2 Coy ASC Train. This was a tough march for the fusiliers, over fourteen and a half miles of dry and dusty roads through flat farming country, laden down with heavy packs and equipment and lacking sustenance from a good meal. The troops crossed the Franco-Belgian frontier that afternoon, reaching the GHQ Line trenches astride the Ypres-Poperinghe road by 5.30pm. The Bns took up position, with the 4th and 7th to the north and the 5th and 6th to the south side of the road. Bde HQ was established at a farmhouse three miles east of Poperinghe. Three platoons from each Coy occupied the trenches, while the fourth was positioned in a wood a short distance to the rear. "We were apparently about five or six miles in rear of firing line. Muttering of guns has developed into a pretty considerable noise”. "It was not very easy to see our position in the dark, but we were not very long before we were in our places for the night”. "We started on what proved to be a frightfully long march. We spent the night in the trenches, there was a good way behind the firing line. We could hear the guns very close, and also could see Ypres on fire”. “At 4.15pm an attack took place between Kitcheners Wood and the canal. It certainly had the effect of stopping the enemy’s advance in this quarter, but the price paid had been very heavy, and actually no ground was gained that could not have been secured, probably without casualties, by a simple advance after dark, to which the openness of the country lent itself”. Meanwhile, at 4pm the Durham Light Infantry Bde was ordered to move to Poperinghe and Vlamertinghe and at 8pm were placed at the disposal of V Corps. The heavy losses incurred during the 23rd led to the York and Durham Bde receiving orders late that night to move to Brielen Bridge on the Yser Canal, to the north of Ypres. They were to be attached to, and support if required, the 13th Bde (5th Divn). The York and Durhams assembled at 1am and marched towards the canal. Soon after dawn a German bombardment caused the first Northumbrian Divn casualties of the war, when a few shells burst amongst the York and Durhams sheltering on the canal banks. The bombardment preceded a German gas attack and infantry assault, which at 3.30am, was made against a sector north east of St Julien, held by the 8th and 15th Bns (Canadian 1st Divn). This time the Canadian troops were prepared for the gas, as each man had been supplied with cotton wads to soak in water and place over their mouth and nose. Nevertheless, despite stiff resistance from the Canadians, by 6.30am their line was breached. Two York and Durham Bns were ordered forward from the canal bank at 7.40am to man the GHQ line and support the Canadians. By 9am the Canadians were forced to withdraw to Locality 'C', where eventually they were surrounded and either killed or taken prisoner. By 3pm the Germans occupied the village of St Julien. The Northumberland Bde was left to rest for most of the day, although subject to continual harassment from German spotter planes and artillery . Some of the men were set to work, in the woods to the rear of the trenches, building camouflaged shelters from waterproof sheets and blankets in an effort to avoid the spotter planes and the weather. At 3.45pm the Northumberland Bde received orders to march via Ypres to the village of Potijze to form a V Corps reserve. “We fully expected that we should be left in the reserve trenches for some days, as up till now all the troops that have come out have been put into billets some way in the rear of the front line, while first the officers, and then the NCOs and men are sent up to the trenches in small parties, or by platoons, to familiarise them with the conditions, previous to the battalion going up as a unit”. At 6pm the Bde formed up on the road and marched towards Ypres, passing streams of wounded men and Red Cross cars heading in the opposite direction. Rumours were rife in the ranks as to the reason for the advance, most numerous were that the allies had made a successful attack and broken the German lines through which they were to advance. Heavy rain began to fall and the Bde received its baptism of fire on entering Ypres around 11pm. Many of the buildings were on fire and the streets were strewn with corpses because the town was now under continual artillery bombardment. “By keeping in close to the houses along the edges of the streets and square, and by doubling past places where the houses had been knocked down, we made pretty good progress without suffering any casualties. When we reached the further side of the square, however, were hung up, and had to halt for about twenty minutes exactly opposite the Cathedral and Cloth Hall” . It would seem that the hold up, which may have been as long as an hour, was due to the Bde in front losing its way. During that halt fifteen men from the 7th Bn were hit, twenty-four horses and mules belonging to the 4th Bn's Transport Section were killed and several wagons were smashed. The personal steeds of Colonel Foster and Captain Cruddas were amongst the casualties and one of the wagons happened to be the Head Quarters section mess cart, which was flung sky high complete with the plates, cutlery and other such comforts. Meanwhile, General E.A.H Alderson (GOC - 1st Canadian Divn) had issued Operation Order 10 at 8pm, ordering a strong counterattack to be made the following morning, in the general direction of Fortuin, St Julien and Kitcheners Wood. The aim was to drive the enemy back as far north as possible, thus securing the left flank of the 28th Divn. The counterattack was to be made by the 10th Bde, York/Durham Bde and two Bns from the 13th Bde under the command of Brigadier Hull (GOC 10th Bde). The Northumberland Bde and Durham Light Infantry Bde were destined to form a Corps reserve at Potijze, that could be called upon to support the attack if necessary. Everyone was extremely relieved when the order to march finally came. Marching at quick pace, the Bn reached the village of Potijze. Still under shellfire, they turned into a large field to the right of the road and were ordered to lie down in small groups of about six men so that the risk of suffering heavy losses was minimized. At 1.30am the Northumberland Bde was also placed under the command of the 10th Bde and ordered to move to a position near the village of Wieltje, to provide support for them in the forthcoming counterattack. It was almost dawn before the Bn rose to continue the march along flooded and almost impassable roads. By this time approximately 30 shells had exploded in the field around them, one man had been wounded and Lt Scaife temporarily struck dumb through concussion. After two miles there was another unexplained stop in a narrow lane followed by a further short march before the Bn deployed in the fields immediately to the east of the Ypres-Wieltje and ‘Oxford’ road junction, on the outskirts of the ruined village of Wieltje. Here they were ordered to lie down in extended order, with a thirty yard interval between Coys, the lead Coys just outside the village, with ‘A’ Coy about one hundred yards to the rear. The York/Durham Bde (5th Bn Green Howards and 5th Bn DLI) were ordered to move to the right through Fortuin and were there by 5am, but realising they were alone and exposed on both flanks, fell back to their former positions. They were alone because there had been insufficient time to assemble the Bns at the correct start position and unbeknown to them, zero hour had been postponed from 3.30am to 5.30am. The five battalions of the 10th Bde arrived at the GHQ Line to discover that there were only two breaks in the wire through which they could advance. As soon as they had passed through the wire heavy rifle and machine gun fire from St Julien and the adjacent buildings began to cut swathes through their lines. The attack failed to achieve the objectives set, but a new line was established with its apex at Vanheule Farm, five hundred yards from the edge of St Julien. When General Hull discovered that the York and Durham Bde were not to the right of his 10th Bde, he ordered the Northumberland Bde, (Corps reserve), to send two Bns to positions south of Fortuin to reinforce the right flank. Bde HQ dispatched the 4th and 7th Bns at 7.30am. “We got off about 3.30 and took up our position, and at 4am our artillery started to shell the Germans. What a row that was. The German guns replied and several of our fellows were hit. Later in the morning we advanced about 500 yards and in doing so we suffered a few casualties, whilst Joicey and Wilf Robinson were also wounded on that day. We did not get much more to do but were rather troubled by a machine gun and a sniper. Once we took up position along the side of a garden, but an aeroplane spotted us and we soon got shelled out of it”. (4th Bn officer, HC - 1 May 15). The 4th and the 7th Bns set off in artillery formation, but when they reached the wire entanglements in front of the foremost trench line, just below the village, Colonel Foster was informed that the attack had already failed. At this stage all he could do was to try and save his men by stopping the Battalions from advancing. Unfortunately, he only succeeded in stopping the two companies bring up the rear of the 4th Bn, the other two having passed out of sight in the rear of the 7th Battalion. He ordered these two companies to occupy the front line trenches they had just reached. Unwittingly, instead of strengthening the line they had extended it to the right, but there was still no contact with the 5th Green Howards and 5th DLI, who had by this time returned to their old trenches in front of Fortuin. “We advanced in artillery formation and then extended into successive lines under machine gun fire, which appeared to be coming from our flank. This became so severe that eventually I had to change direction with the two platoons I had with me, it was here that Joicey and a number of men were hit, and we found it impossible to advance till they were located. This we did after some trouble and were able to get the artillery directed on them, so we remained till dark and dug ourselves in. At 11pm we got the order to return to our original line, where we again entrenched ourselves and got what sleep we could”. (4th Bn Officer, HC - 15 May 15). It was from these battered trenches that the Canadians had launched their attack, and judging from the numbers of the dead who were lying there, they must have met with murderous fire as they went over the top. The trenches were badly smashed up and consisted of little more than a series of ditches and scrap-heaps, while all around were the saddest indications of the sort of fighting which had taken place. The two Companies spent the afternoon removing the dead and doing what they could to repair the trench. Meanwhile, at 6.30am Northumberland Bde HQ responded to 10th Bde orders by sending the 6th Bn to the GHQ line east of the farm (map ref: C22t), where they remained until dusk The 5th Bn remained in reserve at Wieltje. At 9.45am General Hull wired GHQ with the news that the attack had failed. At 7.30pm the Northumberland Bde was placed in reserve under the orders of Lt General E.A.H Alderson (GOC - 1st Canadian Divn). At 7.45pm units were ordered to leave their current positions and to bivouac for the night just to the south of Wieltje. The 4th Bn were relieved between 11pm and midnight and withdrew by Coys under intense artillery fire to their original line near Wieltje. Here they dug in and slept as best they could until 5am. 'A' Coy under Lt Bunbury brought up the rear, but unable to locate the rest of the Bn they had no choice but to lay down and rest by the roadside, within 100 yards of an artillery battery that continued to fire all night. That day Capt Weirs’ arm had been shattered by shrapnel whilst attending a wounded man, Lt Joicey was shot through the leg, Robinson junior, through the foot, while Webster had to return to the lines with a sprained ankle. Thirty-three men had been wounded and twenty were missing, although most reported in the next day. General Sir Horace Smith-Dorrien issued Operation Order No8 at 2.15am. The French were to launch an attack with their right flank on the Ypres- Langemarck road. “At the same time the Lahore Division and troops under General Aldersons’ command, were to recapture much of the ground recently lost. The Lahore Divn was to advance through V Corps positions to attack in the direction of Langemarck, on a thousand-yard front. At the time they were bivouacking near Outerdom, some ten kilometres to the south west of Ypres. They had already marched thirty miles from Bethune to get there and, undisturbed by the clamour of the distant bombardment, most of them were sleeping like logs. By 5.30am they were back on the road, setting off at half-hour intervals to march through Ypres to take up positions north of the St Jean-Wieltje road in preparation for the attack”. (Macdonald: p.251). ‘A’ Coy awoke to find a thick mist covering the ground. As soon as they had eaten, they set off across country to rejoin the rest of the Bn, whose positions near Wieltje were now known. The rest of the Bde was also concentrated around Wieltje, under the orders of the 1st Canadian Divn and ready to act as reserve in the forthcoming attack. 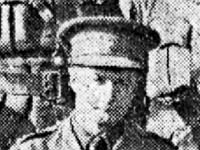 Lt Bunbury was in hope that the Bn would be moved further back from the front line, but they soon discovered that they were destined to move forward again. That morning the 4th Bn was placed in good trenches a little to the east of Wieltje and subjected to a heavy artillery bombardment as German spotter planes flew overhead unhindered. At 10.15am Brigadier General J.F.Riddell (GOC Northumberland Bde) received orders from the GOC 10th Bde to verify a 28th Divn report that stated the enemy was breaking through the front line near Fortuin. At 10.45am the 5th Bn was directed to send forward an officers patrol to verify the report and to move the Bn forward to Fortuin in preparation for a counterattack if the enemy was discovered breaking through. By 12 noon OC 5th Bn was satisfied that the enemy was not attempting to break through at the place indicated. The Bn was subject to heavy shell fire, so they dug in and remained there until dusk, consequently taken no part in the operations of the afternoon. At 12.15pm General Alderson issued Operation Order No 12, instructing a Bn from the 10th Bde to advance alongside the Lahore Division, between Kitcheners Wood and the Wieltje-St Julien road. At the same time, the Northumberland Bde was to attack St Julien astride the Wieltje-St Julien road. When the artillery barrage commenced at 1.20pm, the Bns detailed for the attack were to advance to the positions from which it would be launched at 2.05pm. It was not until 1.30pm that Brigadier-General Riddell received these orders, so he had to summon the 4th, 6th and 7th battalion commanders immediately. He stated, that in the opinion of the Commander-in-Chief, it was imperative for the Germans to be kept out of Ypres and that the only way to do this was to fling more men into the breach, make rapid attacks and counter-attacks and to give the enemy the impression that there were large reserves to call upon. Lt Col Foster was instructed to advance an attack with the 4th Bn in a north-easterly direction with their left flank on the Wieltje-St Julien road. The 6th Bn were to advance with their right flank on the road and the 7th Bn were detailed to provide support for the 4th Bn. The fusiliers of the 4th Bn were just finishing their lunch when Colonel Foster returned with the orders, but by 1.50pm they were all on the move. Lt Col Foster called for his four company commanders and issued orders for the battalion to advance in lines of platoons at fifty yard intervals. Two companies, under the command of Major Stephenson, were to be in the first line and two in the rear under the command of the colonel himself. “The distance from Wieltje to St Julien was approximately 13/4 miles and the ground had not been previously reconnoitred by the staff or any of the officers of the Brigade. No information was received or could be obtained as to the actual position of either our own or the enemy's trenches nor was it known that the GHQ line was strongly wired and that there were only certain places through which the troops would be able to pass. No communication was ever made with the artillery and no artillery officers got in any way into touch with the Brigadier. The time was short, the order to attack being received at 1.30pm, nevertheless considering that any failure to attack on the part of the Brigade might seriously hamper the operations General Riddell decided to carry out the orders he had received impossible as they seemed”. The 4th and 6th Bns reached the GHQ line (map ref: C22b & C23c) and were deployed either side of the Wieltje-St Julien road by 2.05pm, immediately coming under heavy shell, machine gun and rifle fire. The thick wire entanglements in front of the GHQ line caused delay and heavy losses, as the men bunched together to squeeze through the gaps. Nevertheless, the wire was negotiated and the advance towards St Julien commenced. “We lost no time in getting away, and as soon as we passed through the barbed wire entanglements in front of our trenches, we set off in lines of platoons at about forty yards' interval. Plummer, Turner, and Varvill went with our first line two platoons, and Frank Robinson and myself followed with the other two (Nos 1 and 2). Practically from the moment we started off we had to face a perfectly hellish shelling, which increased in intensity as we advanced. Shells of every description literally raining on us from our front, right flank and rear, while it seemed to me in the excitement of the advance that our artillery were giving us no support whatever. The line of our advance lay for about a mile over open ground, and after we had gone a short way, in addition to the inferno of shells in which we were, we became exposed to a very heavy rifle and machine gun fire from the German trenches, which were directly in front of us near a wood at the top of some rising ground, and in such a position that they could fire right over what turned out to be our advanced trench, down on to us. The small arm fire was intense, and the nearest thing I can liken it to is a gigantic swarm of angry bees buzzing all around one. Men were falling on every side, and I felt an intense excitement, but there was no time for thinking, and my one idea was to push on as fast as possible, and to get as many men as possible to follow me, and keep going”. Under circumstances such as these, Companies and Battalions soon get mixed up, and the last point at which I knew I had the major part of my own men still with me was after I had gone about half way, when we had to cross the St Julien road, and here we lay down for a breather. “Frank Robinson was the only one of our officers I remember being there, and we appeared to have about a hundred men still with us, though the various lines were already getting mixed, and a good number of them were not belonging to our Company. From here we could see a trench some hundreds of yards in front of us, which with the scanty instructions we had received might have proved to be a German one, but I am thankful to say that I gave orders not to fire, as it turned out to be our own advanced trench occupied by the Seaforths. One could scarcely hear one's own voice for the awful din, and it was only by shouting at the top of of one's voice from mouth to mouth that an order could be conveyed any distance, This was not a very healthy place to stay in, and we did not remain there many minutes, and when FR and I got up to lead forward again the men, who were perfectly splendid throughout, rose and followed us like one man, the order to advance being scarcely needed. From this point on we were in full view of the German position, and men were falling thicker than ever, but we kept plugging along as fast as we could with our heavy packs, etc., and the perspiration was fairly pouring off me, as though I was in bad training, instead of being hard as nails. After we had gone a short way, I fancied that we were being shot at from a farm which was about two hundred yards to our right, and was in the act of swinging some men round to attack this when some RAMC men appeared in the door of the building, and signalling frantically to us not to fire, waved us on in our original direction, which we then resumed. When still about 200 yards behind our advanced trench, we came to a ditch and bank running across our line of advance, and I had a second breather of a few minutes here, and, while peeping over the parapet to choose the line for our further advance, something struck the parapet, sending a quantity of dirt in my face, and simultaneously I felt something hot touch my cheek, and for a moment thought that I had been hit. I turned to a man behind me, and asked him if I was hit, but he told me that it was only a graze, and that there was only a tiny trickle of blood. It was a narrow shave, but left no more mark than a small razor cut would. I then went on again, but by this time I only had a hazy recollection of seeing Frank Robinson somewhere near me still, as we were approaching the trench. Just about this time I had another close shave, as a 'Jack Johnson' burst, as it seemed, just over my head, and the concussion threw me face downwards on to the ground, while when I looked round, previous to rising to go on again, there was a huge hole just behind me, and several of the men following me were lying wounded on either side, while where it had actually fallen there was no trace of a soul and I fear that three or four of the poor fellows were blown into little bits r pounded into the ground. I eventually landed up at our trench, practically I believe at the same time as Frank Robinson, and accompanied by but a few men, several of whom were not even of our Battalion” (Bunbury: p...). Meanwhile Lt Col Foster had stopped for a breather when several of his men, lying in a shallow ditch behind a hedge, had beckoned him. “I was very glad to do so for we needed the rest, but the few minutes I could give them seemed to pass in a moment’s flash, and at the word of command; “Now, lads, we have some way to go yet, - we must get on’.” They jumped up on the instant and followed me. Looking back as I lay upon the ground after one of our rushes, I saw men being blown twenty feet into the air by the bursting shells and, realising that as there was no cover the quicker we advanced the less we should suffer, I sprang up and ran ahead, shouting to the men to come on as fast as possible” (Foster: p.20). By 2.45pm the remnants of the 4th and 6th Bns had reached the front line trenches (map ref: C17b) and the 7th Bn had joined the attack. Around 3.10pm isolated parties of the 6th Bn pushed forward a further 250 yards to occupy trenches from which the enemy had apparently retired. Elements of the Bn actually succeeded in entering, and for a time occupying the southern portion of St Julien, but they were eventually driven back, mainly due to the effects of gas, and finally occupied a line a short distance to the south. During the whole of this period the Lahore Divn and the Bn from the 10th Bde were not seen. It was subsequently discovered that their orders had been cancelled and the Northumberland Bde had not been informed. The 4th Bn fusiliers who were lucky enough to reach the advanced trenches unscathed were surprised to find they were occupied by a few Seaforth Highlanders (2nd Bn, 10th Bde). To Colonel Fosters' distress, he discovered that eight of the highlanders had been wounded by his men during the advance. Hardly surprising because the Colonel had not been informed that there were still British units in his line of attack. A steady trickle of fusiliers were reaching the trench and it was soon full, so some men had to dig into the rear of it. Crawling along the shallow trench Lt Col Foster was pleased to find Col Jackson and Major Joicey of the 7th Battalion, and Lts Bunbury and Cranage of the 4th had survived. Right at the very end of the trench he found Capt Dixon and Lt Gibson. At 3.45pm, Brig Gen Riddell left Bde HQ in the support trench (map ref: C23a) and went forward, accompanied by his Bde Major, to confer with his Bn Cdrs. At a point about one hundred and fifty yards south of Vanheule Farm (map ref: C17d) he was shot in the head and died instantly. As the senior officer in the front line, Lt Col Foster (OC 4th Bn) assumed command of the Bde and ordered all three Bns to dig in where they were as best they could. A message was dispatched to Colonel Coles CMS, DSO (OC 5th Bn) informing him of General Riddell's death and that as the senior officer in the Bde, command had now devolved to him. However, the location of Colonel Coles HQ was unknown at the time, so it was not until 7pm that he arrived at Brigade HQ. At 7.30pm Col Coles, having ascertained that the services of the Bde were no longer required in the first line trench, ordered the troops to retire and to bivouac at Wieltje. A 4th Bn officer wrote: “After the attack it was a strange sight when darkness fell that night. Although quite close to the German trenches both sides seemed to be tired of fighting for the present, and we were able to get up and walk about with comparative safety and get the Battalions and Companies sorted up ready for everybody else. We had a busy time after that gathering in wounded and burying the dead, and there were many things I saw that night I should be glad to forget. What disgusted me most I think was the way they fired on the wounded crawling back to shelter. There was a farm about half way up used as a dressing station, and this they shelled continuously and any party of stretcher bearers leaving it always came in for a very hot time”. (Hexham Courant: 29 May 15). "a most gruesome job, as in many cases we could only ascertain to what battalion the poor dead fellows belonged by examining their identity discs, which in most cases are worn suspended round the neck by a cord next the skin, and many of the corpses were in a fearful state and their clothes stiff with blood. After a long and laborious time we collected five of our own dead, and I then set the working party to dig two graves for them near the dressing station, while I collected their identity discs and pay books, and went through their packs, haversacks, and pockets, and collected and tied together any little personal belongings which I thought their people might like to have”. “We put two into each grave and after filling them in we put up a little wooden cross to mark where the first men of the 4th Northumberland Fusiliers who fell in action had been buried on the field of battle. The men we buried were Lance Cpl Woodman, of my platoon (who was subsequently mentioned in dispatches for the gallant work yesterday), Privates Herdman, Paxton and Scott” . The Bde withdrawal began at 7.30pm and all were 'relieved' and on their way back to 2nd line dugouts around Wieltje by 11pm. So ended the first encounter with the enemy. The first Bn roll call revealed that 19 men had been killed, 188 wounded and 98 were still missing. Capt's Chipper, Hunting and Plummer, Lts Carrick, Speke and 2nd Lt Allen were all wounded ('D' Coy losing three of its six officers). It was impossible to conduct a proper roll call for several days, because the platoons and companies had all become muddled up and many of the men who had become separated during the attack did not report in until several days later. More than 50 fusiliers from the 4th Bn were actually killed or died of wounds received on that day. In all, the Northumbrian Bde had lost forty-two officers and 1912 men, two thirds of its strength in one afternoon. For the Northumberland Bde, the day passed practically without incident although enemy shelling did cause further losses in the 4th Bn. The Ypres Salient was now much smaller, more dangerous and subject to German artillery shelling from the south, east and north. Colonel G.P.T.Fielding, previously of the Coldstream Guards, arrived at 5pm and assumed command of the Bde. The 4th Bn remained in the Wieltje dugouts for the rest of the week, unable to venture out during daylight due to the continual artillery fire and for fear of snipers. This left them little to do other than improve the dugouts in which they were resting. It was however, an opportunity for the men to write home and attempt to describe the actions of the past few days to family and friends. During the first few weeks in Flanders many of these letters were published by the Hexham Courant and Herald newspapers. Censoring them prior to dispatch became a daily and time-consuming chore for platoon commanders. "we went out again on a working expedition, and this time we went by a circuitous cross country route, so as to avoid the Germans favourite spots for dropping shells, to Hill 60, which was at this time in our possession. Got back to our dugouts about 2.30am, having had a pleasant little cross-country walk of about 8 or 10 miles”. Letter from a 4th battalion officer published in the Hexham Courant newspaper on the 15th of May 1915. “At last we are back from the firing line, where the air is sweeter and one does not need to be continually dodging ‘coal boxes’ shrapnel etc. We are having a rest now after our strenuous ten days right amongst it – in the thick of the biggest artillery fight which has taken place for some time. It is a pleasure to be out of the continuous din of bursting shells and the stink of fumes and dead. Just before we came away last night there was another attack, and those poisonous gases were used by the enemy. (We had respirators over our mouths). I thought the enemy had got through, but some heroes in front of us stuck in and held them back”. “We were addressed this morning by Field Marshall Sir John French, and he stuck it in very thick, said we had done magnificently all the ten days we were under fire etc etc, and thanked us, and in fact said we were no ‘small beer’. So we are bucked up some. Well we are having good sleeps now and reorganising, as we had practically no sleep when we were in the trenches, could only move about under cover of the darkness, as there was always plenty of Taubes flying about watching for us. We feel a little foot sore, not being able to have our boots off practically since we left Blyth, otherwise very fit. It is very pretty countryside here, thickly dotted with little whitewashed thatched farmhouses, and every inch of ground is cultivated. Everything seems much farther out than at this time at home. Quite a change to the desolation of where we were in the fighting line”. "It came down quite low over the Bns dugouts, whereupon all our troops anywhere near opened rapid rifle fire on it, with the result that it fell abruptly quite a short distance in front of where we were”. At 5.45pm the Northumberland Bde was ordered to provide working parties to dig a line south of the Ypres-Zonnebeke road and astride the Menin Road. At 6pm the 4th and 6th Bns were ordered to provide the first relief for these parties. However, most of the 4th Bn were employed digging trenches at Bellewarde Farm between 8pm and 3am while Lt Bunbury was left with a small party of men to clean up the lines and look after the dug outs until their return. Records show that at least 50 fusiliers from the 4th Bn were killed in action or died of wounds during the Battle of St Julien. For information on 4th Bn burial and memorial sites for casualties sustained in this battle, select the link. 1st Canadian Division - Consisted of 1st, 2nd and 3rd Canadian Bdes. The 1st Bde comprised the 1st, 2nd, 3rd and 4th Bns. The 2nd Bde comprised 5th, 7th, 8th and 10th Bns. The 3rd Bde comprised 13th, 14th, 15th and 16th Bns. 45th (Algerian) Division - French Army Division. Geddes Detachment - Named after Colonel A.D Geddes and comprised of four Bns from the 28th Divn. 2nd Bn - Buffs, 3rd Bn - Middlesex, 5th Bn - Kings Own and 1st Bn - York and Lancaster. Northumbrian (Territorial) Division - Comprised of the Northumberland, York & Durham and Durham Light Infantry Brigades. The Northumberland Bde - Comprised of the 4th, 5th, 6th and 7th Bn - Northumberland Fusiliers. The York and Durham Bde - Comprised 4th Bn - East Yorkshires, 4th and 5th Bn - Green Howards and 5th Bn - Durham Light Infantry. The Durham Light Infantry (DLI) Bde - Comprised the 6th, 7th, 8th and 9th Bns DLI. Select link to find out more about this Division. 1st Northumberland Field Ambulance - One of three Territorial Field Ambulance units in the 50th (Northumbrian) Division. Staffed by 10 officers and 224 men from the Royal Army Medical Corps (RAMC) personnel. No2 Field Company RE - Territorial unit of the Royal Engineers (RE). There were two RE Field Companies and a Signals Company in the Northumbrian Division. No2 Coy ASC Train - No2 Company of the Army Service Corps (ASC) Train. The 'train' was the transport, comprising horses, carts, wagons and bicycles. Four companies in a Division. A company assigned to each Brigade and one to Headquarters. Bellewarde - Village east of Ypres. Bellewarde Farm - East of Ypres. Brandhoek - Village 8km west of Ypres (Ieper). Farm Vanheule - Near village of St Julien. Fortuin - Village north-east of Ypres. Kitcheners Wood - West of the village of St Julien. Langemarck - Village to the north east of Ypres. Oudezeele - Village 4km north of Cassel. Potijze - Village to the north east of Ypres. Steenvoorde - 7km east of Cassel. Vanheule Farm - Farm buildings to the right of the Ypres to St Julien road, north east of Wieltje. Wieltje - Village to the north east of Ypres. 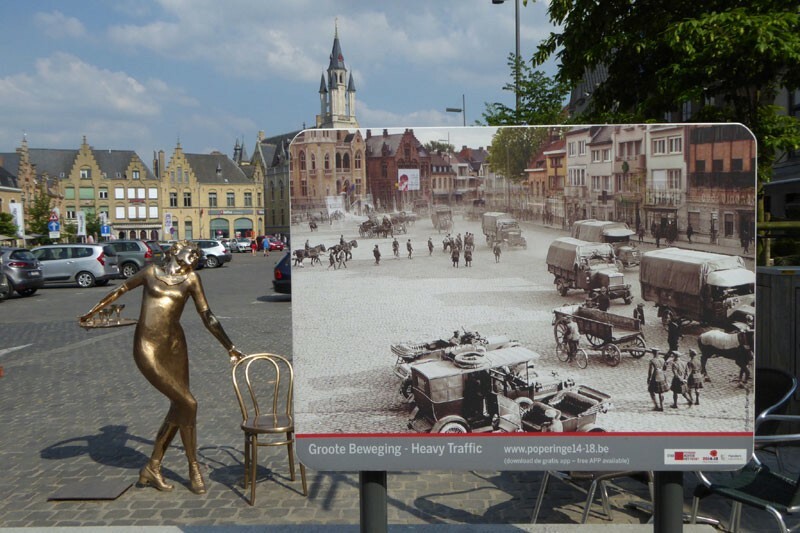 Ypres - Medieval Flemish town around which the salient formed in 1914. Known as Ieper in the Flemish language. Yser Canal - Canal running north north-west from Ypres10. Pont de Briques - Approximately 3km inland from the port of Boulogne.